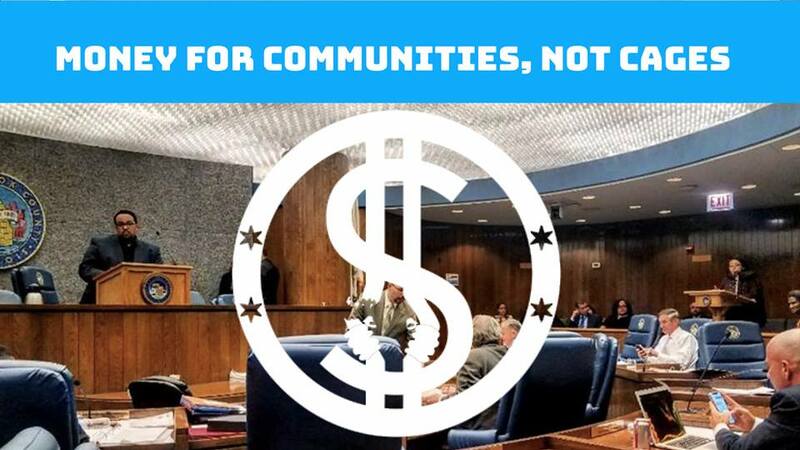 Today, Chicago Community Bond Fund is proud to release “Communities, Not Cages,” a new report documenting why Cook County should reduce the sheriff’s bloated jail budget. In 2013, more than 10,000 people were incarcerated in Cook County Jail on any given day, and the Cook County Sheriff’s Department had a budget of $445 million dollars. On October 21, 2018, there were 6,095 people in Cook County Jail and another 2,180 people in custody on Electronic Monitoring. Despite this massive 44% decrease in the number of people incarcerated in the jail between 2013 and 2018, the Sheriff’s Budget grew 28% over that same five year period—reaching a whopping $588 million in 2018. This historic decline in the number of people in Cook County Jail, which is the result of successful pretrial justice reforms, should coincide with a decrease in the Sheriff’s budget. Over the last several years, under the leadership of the Black Lives Matter movement, communities have pushed to reduce the number of people in the jail. Impacted communities are not only demanding a reduction in incarceration; the people most targeted by the criminal legal system are pursuing proactive solutions in the areas where the government has neglected them the most–and demanding society invest in institutions that promote their well-being, from schools to clinics. The Movement for Black Lives named this approach “Invest/Divest” and made it one of the six core demands of their policy platform released in 2016. Elected officials often discuss criminal legal reform as a cost-savings measure, failing to recognize that local and state governments already spend millions on our most marginalized communities—in the form of policing, surveillance, and incarceration. To effectively repair the harms of mass incarceration, savings generated by criminal legal reforms must be reinvested in the communities most harmed by decades of criminalization. As Cook County spends less on jailing Black and Brown individuals, the money saved must be used to create security and safety in the form of educational access, physical and mental health services, and employment programs for the communities most targeted by mass criminalization.